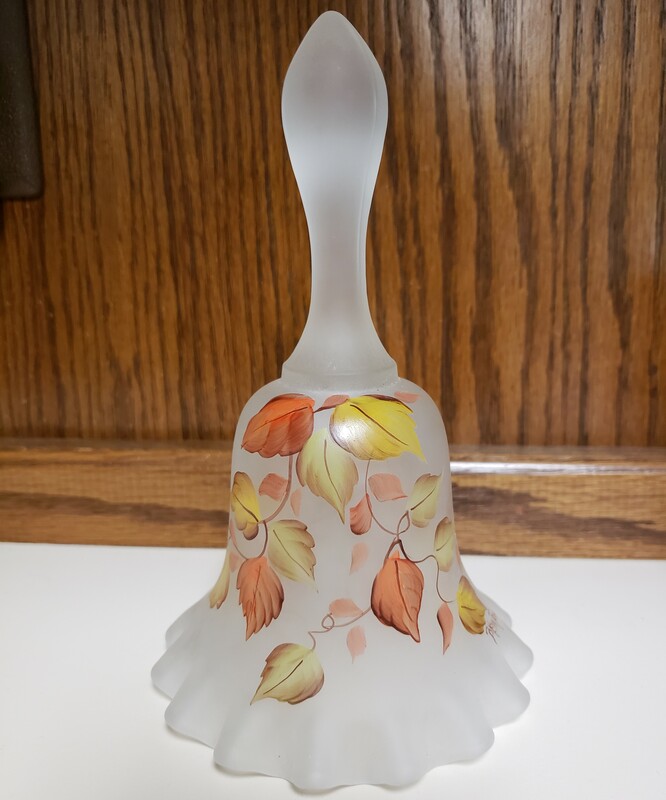 Mosser Crystal Satin Hand Painted Autumn Leaves Bell, Bargain Shack offers Boyd Glass, Mosser Glass, L.G. Wright, and Contemporary Collectible Glass including Vaseline Glass - J.B. Scottie Dogs, Pooche, Animal Covered Nests, Toothpick Holders, Salts, Glass Animal Figurines, Clowns, Dolls, Slippers, Vehicles, and More! This is a beautiful Mosser Crystal Satin Hand Painted Bell. Done by former Fenton artist Barbara Newton it is beautiful decorated with autumn colored falling leaves. You are going to love it! Copyright © 2019 Bargain Shack offers Boyd Glass, Mosser Glass, L.G. Wright, and Contemporary Collectible Glass including Vaseline Glass - J.B. Scottie Dogs, Pooche, Animal Covered Nests, Toothpick Holders, Salts, Glass Animal Figurines, Clowns, Dolls, Slippers, Vehicles, and More! All images, graphics, and information presented on this site are the property of Bargain Hunters and www.bargainshack.com. No copying, use, or reproduction is allowed without the express written consent of the site owner.